Background: My alma mater, Oberlin College, was founded in Ohio in 1833 with 44 students, 15 of them women. Four years later it allowed women to enroll in the regular college degree program. Thus it became the first co-educational institution in the United States. 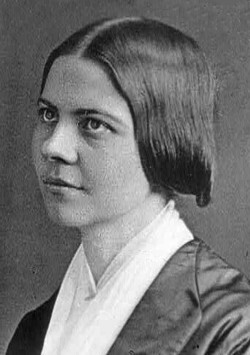 Back East, a feisty 25-year-old abolitionist named Lucy Stone learned that Oberlin was granting degrees to women. She traveled to far-off Ohio. When she received her baccalaureate degree in 1847, she became the first female college graduate from Massachusetts. Three years later she organized the National Women's Rights Convention in Worcester. That was in 1850. Women would have to wait another 70 years before the ratification of the 19th Amendment guaranteed them the right to vote. 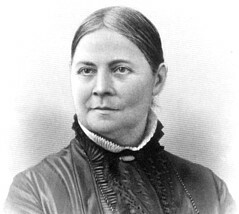 But long before that, Lucy Stone returned to Oberlin in 1883 on the occasion of the Jubilee honoring the college's 50th anniversary. For this six-day celebration, the students had erected a tabernacle in the park, capable of seating 3500 people. On Saturday, June 30, one of the speakers was Ohio's Rutherford B. Hayes, wounded five times in the Civil War and, until two years before, the 19th President of the United States. "Oberlin has practically proved that young men and young women can be educated together by the same instructors and in the same classes, up to the highest standard of collegiate learning, without harm to habits and character. "Oberlin is the pioneer college to teach that young people, white and colored, can be educated under the same roof on terms of perfect equality, with no loss of self-respect or dignity. "I shall never forget the affecting scene when I and the young soldiers who were with me met a number of Union soldiers who had been been wounded and made prisoners in one of the disastrous engagements in the early part of the war. The men we met were from Oberlin. We heard nothing from those men that was not worthy of Oberlin. They were pale and weak and suffering, but they uttered no word which their dearest friends at home would not be glad and proud to hear them speak. God bless Oberlin!" On Tuesday and Wednesday evenings, July 3 and 4, the Musical Union with its 140-voice chorus and four visiting soloists would present an oratorio written 37 years before: Felix Mendelssohn's Elijah. It was about 10:45 on the final morning, the Fourth of July, when Lucy rose from her seat on the podium of the auditorium. I've excerpted her address from Nina Winterbottom's transcription in this book, which is available online here. Oberlin is proud of her founders, of their poverty, of their faith, of their perseverance. Their story will be told as long as one stone of all they builded remains upon another. The idea of equal rights was in the air. The wail of the slave, his clanking fetters, his utter need, appealed to everybody for help. Oberlin is proud that it reached down its hand to help the slaves to their liberty. But new occasions teach new duties. Time makes ancient good uncouth. Another deed waits for Oberlin to add to its crown of honor. I should be no true daughter of Oberlin, still less should I be true to myself, if here to-day I failed to ask this younger Oberlin to take another and the next step in the great movement for the political equality of women. their fight is fought, their battle won. That crime and that folly are the withholding from women the opportunity of giving consent to the laws they are required to obey. It was for this principle that our fathers contended in the war of the Revolution. 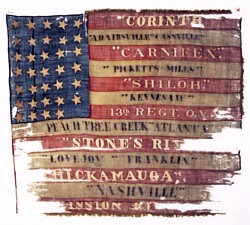 As I sat here, I looked up to your torn and tattered flag. It marks the battle-fields where your soldiers carried it for freedom. But I remember that other flags are floating on our hilltops everywhere, and they float over twenty millions of women who are taxed without representation and governed without their consent. When the war was ended and the Government asked in its reconstruction, What shall we do with the Negroes? the answer was, These men have fought our battle and carried our flag. Now let them have the ballot. And they got it. And then it asked, What shall be done with the rebels? and with one voice the people said, Let them have amnesty and universal suffrage. And they got it. And then it was asked, What shall we do with Jefferson Davis  the man who had been the greatest traitor to his country? And the nation, looking over all its borders to find the worst punishment it could inflict upon him, did not put him in prison for life, did not set him to hard labor, did not load him with chains that should clank in human ears  but it took away his right to vote! It made him the political peer of every woman in the land. 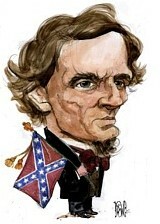 When the women who had in camp and on the field nursed the soldiers, who had turned night into day to raise supplies for the Sanitary Commission and to help the brave boys in blue  when these women went to Washington and asked, In the reconstruction of the Government, what will you do with us? the Government left us all the peers of Jefferson Davis. Now it is to save women from this wrong and shame that Oberlin should take its next step. O men who have been so wise, so kind, and so just to women, take one step more and help lift us from peerage with Jefferson Davis!